Li vows not to give up plane hunt - video door phones,intercom system,video door phone,modules.CCTV. China has begun to searching for a missing Malaysia Airlines jet with 239 passengers and crew on board in Chinese territory which covers a northern corridor through which the aircraft could have flown, Chinese Ambassador to Malaysia Huang Huikang said. 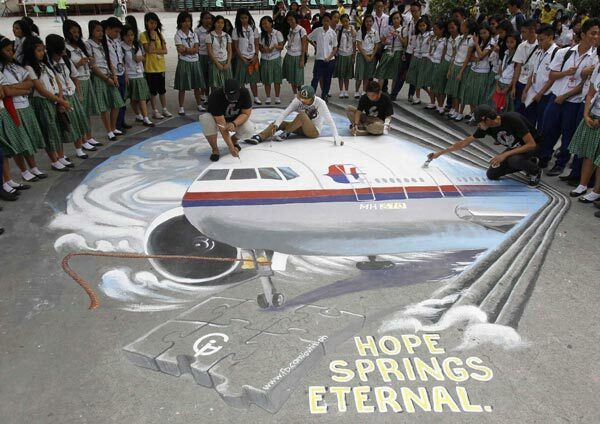 [align=left]Artists put finishing touches on a 3-D painting at a school in Manila, the Philippines, on Monday to pray for those aboard the missing Malaysia Airlines jetliner on flight MH370. [/align]The search for the Malaysia Airlines jetliner remains a top priority, Premier Li Keqiang said on Monday when he asked Kuala Lumpur to provide timely, accurate and comprehensive information. "Although search areas keep expanding and difficulties ahead are increasing, we will not give up as long as there's a slim hope," Li said during a phone conversation with his Malaysian counterpart Najib Razak. Li said more than 10 Chinese vessels and several aircraft have been sent to suspected crash sites and China has also mobilized 21 satellites to support the search. He urged Malaysia to narrow the scope of the search and to draw up new search plans. "It's Malaysia's responsibility to fulfill the promise to take care of the affairs regarding relatives of the missing passengers," he said. The Malaysian premier thanked China for its help and said his country will spare no efforts in searching for the plane. It will keep updating information for China and other countries taking part in the hunt. The Boeing 777-200 went missing on March 8 with 239 people on board, among them 154 Chinese, sparking a massive search. It disappeared about 40 minutes after leaving the Malaysian capital for Beijing. The hunt entered its 10th day on Monday, and the number of countries involved has risen from 14 to 26. Initially, the plane was believed to have crashed in waters between Malaysia and Vietnam, but Najib said on Saturday it may have changed course and deliberately disappeared on the other side of the Malaysian Peninsula. Malaysia Airlines Chief Executive Ahmad Jauhari Yahya said at a news conference on Monday that Malaysia's military has kept some information about the plane confidential because it concerns national secrecy. An investigation into the possibility that the pilots committed suicide is also underway, he said. Malaysian police are investigating a flight engineer who was among the passengers. The engineer, Mohd Khairul Amri Selamat, 29, a Malaysian, has said on social media he had worked for a private jet charter company, a senior police official told Reuters. Investigations into the pilots intensified as officials confirmed that the last words "No problem, good night" spoken from the cockpit came from the co-pilot, Fariq Ab Hamid, after a key signaling system was manually disabled. Police have revisited the two pilots' homes, retrieving a flight simulator. Malaysia's acting Transport Minister Hishammuddin Hussein said investigators will continue to check the backgrounds of the pilots, crew and ground staff who worked on the plane. US investigators quoted by The New York Times said that with Malaysia announcing that the plane was deliberately diverted for an unknown reason, the county's refusal to accept offers to solve the "unprecedented mystery" is forcing it to rely on a limited number of personnel. Hishammuddin, apparently responding to the accusation, said at the news conference, "Malaysia has cooperated with international intelligence agencies such as the FBI and Interpol since the first day." New search areas announced on Saturday encompass a northern corridor stretching approximately from the borders of Kazakhstan and Turkmenistan to northern Thailand, as well as a southern one from Indonesia to the southern Indian Ocean. Chinese Foreign Ministry spokesman Hong Lei said on Monday, "China will not reduce its current forces and will expand the search area on water and on land by strengthening communication with other countries." China will adjust and draw up a scientific search plan based on new information that Malaysia has provided and on its search experience during past days, Hong said. Wu Peixin, an editor at Aerospace Knowledge magazine, said it would be impossible for the aircraft to enter the detection range of military radar without being found. Zhao Lei and Xinhua contributed to this story.